A resistance temperature detector (RTD) can also be called a resistance thermometer as the temperature measurement will be a measure of the output resistance. The main principle of operation of an RTD is that when the temperature of an object increases or decreases, the resistance also increases or decreases proportionally. The main difference between a RTD and a Thermistor is that the sensing element used in a RTD is a metal and a thermistor uses ceramic or polymer material. As platinum is the most commonly used metal for making RTD’s, the device can also be called Platinum Resistance Thermometers (PRT’s). RTD types are broadly classified according to the different sensing elements used. Platinum, Nickel and Copper are the most commonly used sensing elements. Platinum is considered the best as it has the widest temperature range. This is shown in the resistance versus temperature graph below. Platinum type RTD is also known for its best interchange ability than copper and nickel. It also has the highest time stability. PRT’s can also be used in unsuitable environments where it can reduce atmospheric metallic vapours and also catalizable vapours if the element is bare. It can also be used in radioactive environments. In industrial applications, a PRT is known to measure temperatures as high as 1500 degree Fahrenheit while copper and Nickel can measure only to a maximum of 400 degree Fahrenheit. RTD’s are available with single, double, or triple windings, each electrically separated. Use of more than one winding enables two independent measuring circuits to measure the same temperature, and also permits more than one measurement to be made with only one sensor installation. However, the additional mass introduced to the sensor by adding windings and their associated support and encapsulating materials increases both the response time and the conduction error. Using separate sensors provides mechanical independence of the sensors for maintenance. RTDs should generally be of spring-loaded, tip-sensitive construction, with a 1/4-inch-diameter sheath. RTD’s are available with either two, three, or four output wires for connection to the secondary instrument as shown in the figure below. The various wiring arrangements are designed to reduce and/or eliminate any errors introduced due to resistance changes of the lead wires when they also undergo temperature changes. RTDs used for electrical equipment generally use either a three-wire system or a four-wire system having paired lead wires. Copper lead wires are satisfactory for all the arrangements. For a given RTD, all the lead-wires should be of the same gauge and the same length, and should be run in the same conduit. The four wire system is little affected by temperature induced resistance changes in lead-wires, and, of all the arrangements, it is affected least by stray currents. It, therefore, is used to measure temperature differences and is used generally for making very accurate measurements. The three-wire system is generally satisfactory for industrial measurement using a secondary instrument that is remote, say, more than 3 meters distant from the RTD. 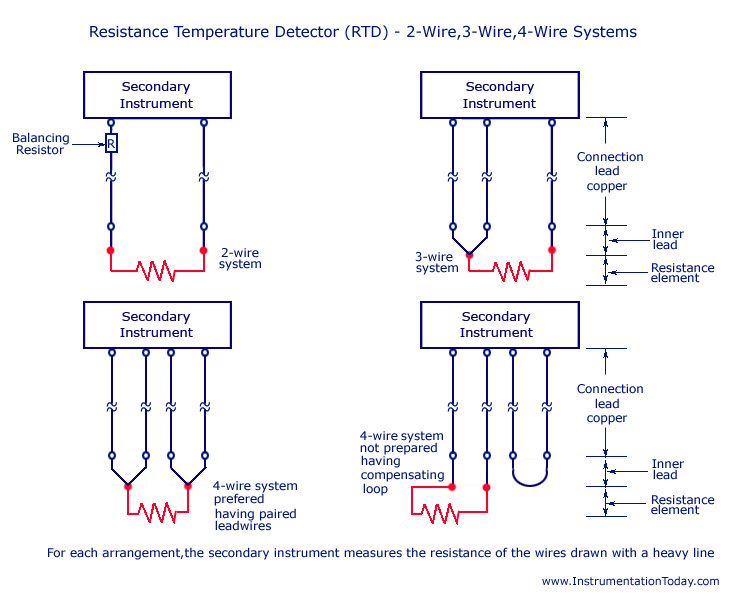 Although the error caused by temperature change in the leads is virtually eliminated in a 3-wire arrangement, a slight non-linearity in the resistance change is introduced with this scheme. An electric dc power supply is required to provide current for the resistance­ measuring circuit. The power supply is normally applied through the secondary instrument. If the secondary instrument is a transmitter having a current output of (4-20) mA, then the power is carried by the two output wires of the transmitter. For a single RTD, the terminal block should be able to handle four lead wires. The head shall be explosion proof where and as needed to conform to a hazardous area rating. However, explosion proofing will not be required if the system is intrinsically safe. In this case the thermocouple head should be specified to be weatherproof. The principles for grounding that are stated in “Grounding” for Thermocouples apply to RTDs, with the exception that the sensitive portion, the resistance wire, of a RTD is never grounded because it must not be shorted. A RTD in a power device, such as a transformer, should be grounded locally; otherwise, RTDs are normally grounded at the power supply. A power supply and all its associated RTDs should be grounded at only one point. If local grounding is required for a RTD, then an individual power supply is required for this RTD. The RTD shielding principle is the same as that of Thermocouple Shielding. The transmitter is the most commonly used instrument for transmission of RTD signals. A transmitter may be mounted either on an enclosed rack or locally. A local transmitter may be mounted on a Thermowell and supplied with it as a complete assembly. 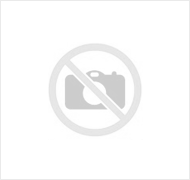 The most commonly used RTD transmitter is the so-called “Smart” transmitter. A typical “Smart” temperature transmitter is remarkably versatile: It is suitable for Platinum and Nickel RTDs; 2, 3, or 4 lead wire arrangements; 100, 200, or 500 ohm Platinum sensors, etc. This same instrument can also be used as a thermocouple transmitter, suitable for every thermocouple combination commercially available. Ability to be matched to close tolerances for temperature difference measurements. i am using 4 wire resistance thermometer with PLC. now that day these sensor are not working properly.can i used 3 wire RTD against 4 wire resistance thermometer.